Dance Legend 33 Last Serenade. Last Serenade might feel the least unique of these 3, it's still a gorgeous pink! All those sparkles that look a little silver here and there are holo, what's not to love? Dance Legend 36 Holy Diver. Holy Diver leans a bit more green than on my pics, still a clear turquoise color though! My favorite of these 3, it's such a perfect Summer color :) I've been wearing this as pedi for a couple of days now (also without base/topcoat), and even though I often walk around barefooted and had kittens attacking my toes, it still looks great, no chips at all! Dance Legend 32 Beautiful Lie. Beautiful Lie is beautiful indeed! In daylight these still have a hint of holo, but look more like an even mix between color and silver (holo) glitter. 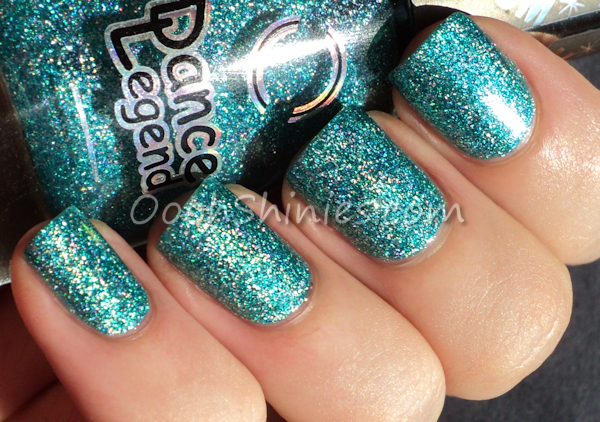 And they're fab in sunlight, they're so packed with holo that it looks quite linear as well! I did a little stamping over the blue polish as well, but I figured this post has enough photos as it is, so that'll come next time :) Take care & thanks for stopping by!